Renting 2 bedrooms of this 4 bedroom villa -Four bedroom villa just steps away from the Silver Sands Beach! Just a short stroll to the beach, gated community, family friendly, constructed in 2012- one of the newest villas in Silver Sands. Count it! Just 65 steps to the white sandy beach of Silver Sands!! Arawak By The Sea Jamaica Villa is a brand new, modern beachfront villa situated in the beautiful Silver Sands Beach Resort, Duncans, Trelawny. Silver Sands is only 45 minutes from the Montego Bay Airport. The name Arawak was inspired by the first Taino Indian inhabitants of Jamaica or as the Arawaks called it - Xamayca (meaning land of wood and water). The villa has 4 bedrooms and 4 en suite bathrooms, ultra modern kitchen with granite counters and stainless steel appliances; living and dining room with large picture windows and doors that opens out to a patio overlooking the beach. There are only 65 steps to the beach. The villa comes with two full time staff members that will pamper you with sumptuous meals, housekeeping, and laundry services. One roundtrip airport transfers to and from Montego Bay are included in your villa rate for weekly bookings. Your villa comes with a cook/chef and a housekeeper. Your cook will handle the grocery shopping and meals. She will pre-stock your first few meals, and then finish the week's shopping after meeting with you. A typical grocery budget is about $25 and more per adult per day. This may vary depending on the menus you request. (This budget includes a modest amount of Red Stripe Beer, Rum & moderately priced wines). If you wish to go to the various markets with your cook, you are welcome. Otherwise, simply review with her your tastes and distastes and she'll handle it all while you stay at the villa/beach and relax. At week's end she will present receipts and reconcile your account (unless fresh fish, lobster and vegetables are delivered to the villa, then she will need cash). Your housekeeper will take care of every detail of your bedroom and bath. She will return your neatly folded laundry each afternoon, and turn down your bed each evening. Upon request, a masseuse will come to the villa to provide treatments so you don't have to leave home for this luxury. dinners. We provide highchairs and cribs on request. We can also provide a wonderful, reliable nanny for $10 US per hour. Arawak By The Sea has a sofa bed in the living room, thus accommodating up to a maximum of ten persons. Extra charges of $25pp/pn applies. There are wonderful sea views from the balcony, where you may dine and relax, enjoying the cooling trade winds. **This villa is only 65 steps from the Beach and close to the beach bar and grill, restaurant etc of Silver Sands. **Villa faces to the North, offering sea views and cool sea breeze. **There is a Spacious Living & Dining Room. Child's highchair available. **For extra persons and larger families, this Living room has a sofa bed which sleeps two persons. **There are three bedrooms on the upper level and one bedroom on the lower level. Baby crib available. **Parents retreat, the master bedroom suite, with spacious bathroom en suite, featuring a double whirlpool tub, separate shower and double basins. **For extra protection, there are Insect screening on all exterior doors and windows. **Villa is Equipped with cable television (reception not guaranteed), mini stereo with radio & DVD/CD player, Telephone. **Free wireless broadband internet access. ** Fully equipped kitchen with breakfast bar. **Cook and housekeeper work flexible 8 hour day. 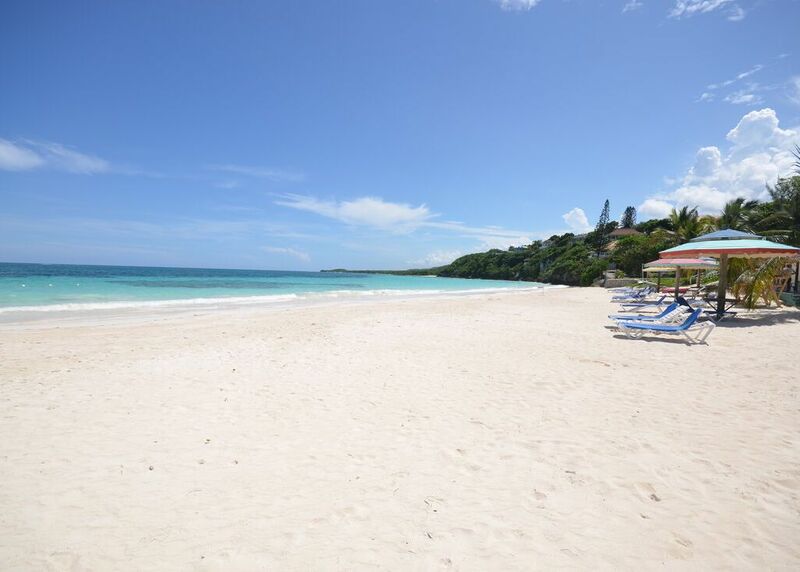 Silver Sands is a beautiful jewel in Jamaica which is located approximately 60 minutes from the Montego Bay airport. It is this special community of wonderful villas that shares one of Jamaica's most beautiful white sandy beaches. Silver Sands is a gated community and the owners are either foreigners or Jamaican's who use these villas as their holiday homes. Each villa is individually decorated to the owner's unique tastes. There are quite a large variety of villas in Silver Sands ranging from 2 bedrooms cottages to large 6 bedroom villas. Some villas are on the beach, some or just a short walk away to the beach. The great advantage to Silver Sands is that there are many rentals to suit everyone. There are affordable rentals, deluxe villa rentals, small honeymoon cottages, large family reunion villas, villas with pools and spas, or lovely cottages by the beach. The one thing that they all share is the magnificent crystal clear waters of Silver Sands.